The Boxing Truth®: What’s Next For Jacobs And Garcia? On August 1st the Barclays Center in Brooklyn, New York played host to a doubleheader that had some interesting storylines in regard to both the Middleweight and Welterweight divisions. In the Middleweight bout top contender Daniel Jacobs faced former WBC Jr. Middleweight world champion Sergio Mora. Jacobs, who entered the fight holding interim/regular champion status in the World Boxing Association’s (WBA) Middleweight ratings put his status as the WBA’s top rated contender on the line in this fight. The story of this fight as this observer said prior to this card was a battle between Jacobs’ punching power and ability to get an opponent out of there at any point during a fight versus Mora’s ability to execute his offense in spurts, but also nullify his opponent’s offensive rhythm with his ability to be elusive and counter punch. The question in my eyes going into the fight was whether or not Mora could avoid Jacobs’ power for a full twelve rounds. The opening round of this fight is a likely candidate for round of the year. Jacobs was able to score a knockdown of Mora with a flush counter right hook midway through the round. To Mora’s credit he was able to get up from being dropped by a punch that would have likely ended the night for some fighters and seconds later would respond by catching an aggressive Jacobs with a counter left hand sending Jacobs down to the canvas. As was the case with Mora, Jacobs showed his mettle and got up from the knockdown. It was in the second round however, that this fight would be brought to a sudden and some might argue “inconclusive” conclusion. Jacobs was credited with a knockdown of Mora late in the round when Mora went down while attempting to avoid a barrage of punches from Jacobs. Mora’s right leg appeared to buckle underneath him causing the knockdown, though this observer could not tell if a punch from Jacobs landed prior to Mora going down. Although Mora was able to beat the count, he was unable to continue and the bout was stopped. It was revealed by Mora the day after the fight that x-rays showed that his right ankle suffered an avulsion fracture. An argument can and perhaps should be made that this is a fight that deserves a rematch as soon as Sergio Mora recovers from his fractured ankle. Although this fight was short, both fighters were able to have periods of success during the fight and this observer believes that there should be a rematch. In terms of what this will do as far as Daniel Jacobs’ standing in the Middleweight division, he finds himself essentially in the same position he was in prior to this fight. He remains the WBA’s top Middleweight contender and theoretically should be the potential opponent for the winner of the upcoming Middleweight unification bout between undefeated WBA/IBO world champion Gennady Golovkin and IBF champion David Lemieux, which will take place on October 17th. Although this observer is of the opinion that there should be a rematch between Jacobs and Sergio Mora once Mora has healed from his injury and is medically cleared to get back in the ring, another potential opponent that could be in Jacobs’ future is undefeated former WBO world champion Peter Quillin. 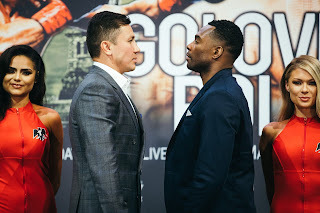 A fight between Jacobs and the winner of Golovkin-Lemieux or a bout against Quillin are each interesting fights that would likely interest both fans and experts alike. A rematch against Sergio Mora however, is also interesting and it would be a shame if a rematch does not take place off of what had the makings of an exciting fight that unfortunately was left with an “inconclusive” ending. The second half of the doubleheader featured a Welterweight fight between undefeated WBA Jr. Welterweight world champion Danny Garcia and former two-division world champion Paul Malignaggi. In what was Garcia’s official debut in the 147lb. Welterweight division, it interested me to see how he would respond to facing a fighter in Malignaggi, who at his best is among the best boxers in the world. It also interested this observer to see what kind of effect Malignaggi’s last fight, a knockout loss at the hands of former IBF Welterweight world champion Shawn Porter in April of last year would have on him. The key to this fight was whether or not Malignaggi would be able to execute his offense in spurts and use his elusiveness and angles to avoid Garcia’s offense. Although it was not surprising to see this fight fought at a tactical pace, the main difference in my eyes was Garcia’s ability to dictate how the fight was fought and being able to land his right hand more than occasionally on Malignaggi. It appeared early on that Malignaggi was having difficulty in using lateral movement in attempting to evade Garcia’s offense. As the fight progressed Garcia began to gradually impose his will, applying consistent pressure and keeping Malignaggi on the defensive. Garcia was also able to open a cut over Malignaggi’s right eye in round three. Although Malignaggi was active in throwing punches he simply was unable to turn the tempo of the fight in his favor and as the rounds went on it appeared that the accumulative effect of Garcia’s punches were taking a toll on him. The always “Game” Malignaggi remained competitive throughout this fight, but he could not find a way to negate Garcia’s pressure and could not discourage him from coming forward. The effects of the punishment dished out by Garcia convinced Referee Arthur Mercante Jr. to stop the fight in the final minute of the ninth round. It was a disciplined performance against a fighter who is very difficult to look good against by Garcia. Prior to this fight, I stated if Garcia, who still currently holds the WBA world championship in the Jr. Welterweight division were successful in this fight against Malignaggi that it was logical to assume that the move up to the Welterweight division could be permanent. There was nothing in this fight that would discourage Garcia from continuing to campaign as a Welterweight, in my opinion. If he were to stay in the Welterweight division it will be interesting to see where Garcia might fit into the mix of what is a very deep division. One fight that this observer believes might be interesting would be a fight between Garcia and former IBF Welterweight world champion Shawn Porter. Both fighters have aggressive styles and a match- up between the two could be a fight of the year candidate. We will simply have to wait and see what Garcia decides to do for his next fight. As for Paul Malignaggi, following the fight Malignaggi stated that he will probably not fight again after losing this fight to Garcia. This observer stated prior to the fight that an argument could be made that Malignaggi was fighting for his career against Garcia. Malignaggi, who has earned recognition in his second career for his work as a Boxing broadcaster has always given it his best every time he has stepped in the ring. Although some may choose to focus more on the fights that Malignaggi lost in his career, he deserves the respect of Boxing fans for not only being a former two-division world champion, but also a fighter who has always been willing to fight anyone. If this loss does indeed mark the end of Paul Malignaggi’s career as a fighter, this observer has only one thing left to say. Congratulations to Paul Malignaggi on a fine career.